Previous studies have shown that depletion of CD8+ cells during acute and chronic simian immunodeficiency virus (SIV) infection leads to increased viral replication, morbidity, and mortality, which have been attributed to loss of CD8+ T cell-mediated control of SIV. However, these studies did not exclude that CD8+ cell depletion increased homeostatic proliferation of CD4+ T cells, resulting in increased viral targets and, therefore, viral rebound. Chronically SHIV89.6P-infected cynomolgus macaques were CD8+ cell-depleted, and the frequency, cell number, and phenotype of CD4+ T cells and viral infection were examined using flow cytometry and quantitative real-time PCR. The frequency and number of Ki-67-expressing CD4+ T cells were increased with CD8+ cell depletion. This proliferation of CD4+ T cells occurred even in animals with no rebound of viral loads. Most of the proliferating cells were effector memory CD4+ T cells. Plasma simian HIV (SHIV) RNA copies positively correlated with proliferating CD4+ T cells and SHIV DNA copies in Ki-67+ CD4+ T cells. Although this study does not exclude an important role for virus-specific CD8+ T cells in SIV and SHIV infection, our data suggest that homeostatic proliferation is an important contributor to increases in plasma viremia that follow CD8+ cell depletion. Although early studies indirectly indicated that CD8+ T cells are involved in controlling HIV infection (summarized in Ref. 1), the strongest direct evidence supporting the important role of CD8+ T cells in controlling both acute and chronic HIV infection has come from a large number of studies examining the effect of CD8+ cell depletion in SIV-infected nonhuman primates (2, 3, 4, 5, 6, 7, 8, 9, 10, 11, 12, 13). These studies have been interpreted to demonstrate that in vivo CD8+ T cells directly protect monkeys during SIV infection because depletion of CD8+ T cells by mAbs results in rapid increase of viremia, disease progression, and reduced survival of animals. One caveat to all these studies, however, is that depletion of CD8+ T cells may perturb homeostasis of other cells and in particular CD4+ T cells. Thus, the increases in viral load may, at least in part, be due to increased homeostatic proliferation of CD4+ T cells and augmented SIV target generation in these animals. The total number of peripheral T cells is constantly maintained due to a balance between death and homeostatic survival and proliferation in the periphery. Naive CD4+ T cells seem to require low-affinity MHC/self-peptide contact and IL-7, whereas long-term survival of memory CD4+ T cell seems to be MHC class II-independent (summarized in Ref. 14). T cell compartments sense each others size changes most likely due to the common dependency on common γ-chain cytokines such as IL-7 and IL-15, underscoring the crucial role these cytokines may play for homeostatic proliferation and survival of CD4+ and CD8+ T cells (14, 15). Constant T cell numbers are maintained only on the level of total T cell numbers independent of CD4 or CD8 phenotype; therefore, compensatory homeostasis leads to expansion of the reciprocal T cell subsets in CD4+ or CD8+ T cell-depleted mice (16, 17, 18) and in humans with decline in CD4+ T cells due to HIV infection and chemotherapy (19, 20). Activated CD4+ T cells and resting effector memory CD4+ T cells are the major sources of progeny virus during acute SIV infection (21, 22, 23). At the chronic phase of SIV infection, greater than 75% of infected cells are activated CD4+ T cells (24). Activated cells are much more efficient at producing virions (23) and are most likely the major source of new virus (25). If CD8+ cell depletion alters CD4+ T cell homeostasis and therefore activation and proliferation of CD4+ T cells, this could have an impact on the availability of targets for SIV. Indeed, we show in this study that CD8+ cell depletion results in proliferation of effector memory CD4+ T cells, the main target cell population for SIV and possible SHIV89.6P infection. Furthermore, we show a direct correlation between proliferating Ki-67+ CD4+ T cells and plasma viral loads and also a correlation between the frequency of simian HIV (SHIV)3 infected proliferating CD4+ T cells and plasma viral load. This proliferation is not secondary to rebound viral replication-induced activation, as it occurs even in the absence of rebound viremia in CD8+ cell depleted animals. Our findings suggest that homeostatic proliferation of CD4+ T cells contributes to the increased plasma viremia found in CD8+ cell-depleted SIV- and SHIV-infected macaques. Our studies also underscore the role CD4+ T cell homeostatic proliferation may play in viral replication and viral burden in HIV-infected individuals. Cynomolgus macaques were housed at the BIOQUAL animal facility according to standards and guidelines as set forth in Animal Welfare Act and “The Guide for the Care and Use of Laboratory Animals,” and according to animal care standards deemed acceptable by the Association for the Assessment and Accreditation of Laboratory Animal Care International. All experiments were performed following Institutional Animal care and Use Committee approval. Macaques were immunized with recombinant DNA vaccine and IL-15 immune adjuvant and challenged with SHIV89.6P 2 years ago as previously described (26). SHIV RNA levels were measured using SIV gag primers in a quantitative RNA RT-PCR assay (limit of sensitivity 50 SIV RNA copies/ml), which was run on an ABI 7500 Real-Time PCR cycler (Applied Biosystems). Macaques were treated with the CD8+ cell-depleting Ab cM-T807 (provided by the National Institutes of Health Nonhuman Primate Reagent Resource Center) on day 0 s.c. (10 mg/kg) and on days 3, 7, and 10 i.v. (5 mg/kg). PBMC were isolated from heparinized blood within 4 h after blood collection by density centrifugation (1.075 g/ml, Percoll; Amersham Biosciences). Cells from mesenteric lymph nodes (MLN) and peripheral lymph nodes (PLN) were isolated by first mincing the tissues and then incubating in digestion medium (0.15 mg/ml DNase; Roche Applied Science and 3 mg/ml Collagenase A; Roche Applied Science). Cells were directly stained ex vivo with a previously determined appropriate amount of Abs for 30 min at 4°C and fixed with 1% paraformaldehyde solution as previously described (27, 28). For intracellular anti-Ki-67 staining, cells were first surface stained, then fixed/permeabilized (Cytofix/Cytoperm; BD Biosciences) and stained with anti-Ki-67 Abs or isotype control for 60 min at 4°C. At least 200,000 events were collected per sample on a FACSAria flow cytometry instrument (BD Biosciences) and analyzed using FlowJo software (Tree Star). The following fluorochrome-conjugated anti-human mAbs that cross-react with cynomolgus macaque Ags were used: anti-CD3 (clone SP34; BD Biosciences), anti-CD4 (L200; BD Biosciences), anti-CD8 (DK25; DakoCytomation), anti-CD45RA (5H9; Invitrogen), anti-CD62L (SK11; BD Biosciences), anti-Ki-67 (B56; BD Biosciences), and anti-CCR5 (CD195, 3A9; BD Biosciences). For analysis of viral DNA, SIV-gag-based assays were used because SHIV-89.6P is composed of the SIVmac239 with the HIV-1-derived auxiliary genes tat, vpu, and rev and the env gene derived from HIV-189.6 (29). SIV-gag DNA was determined in triplicate in sorted Ki-67+ and Ki-67− CD4+ T cells by quantitative real-time PCR method (21). To measure T cell-associated viral DNA, SIV-gag primers and probe and a PerkinElmer ABI 7700 instrument was used as previously described (6, 21, 30). The assay was calibrated using a cell line that carried a single copy of proviral SIV DNA as previously described (21). Statistical analysis was performed using Mann-Whitney U test, Student’s t test, nonparametric Wilcoxon signed-rank test for paired samples, and Shapiro-Wilk W test for normality. Values for p < 0.05 were considered significant. The JMP statistical analysis program was used (SAS Institute). In this study we treated DNA-vaccinated cynomolgus macaques, which were challenged with SHIV89.6P 2 years ago (26), with depleting anti-CD8 mAbs (clone cM-T807) for 10 days. CD8+ T cell numbers were already greatly reduced from peripheral blood of animals by day 3 of CD8 depletion (Fig. 1⇓A) and slowly recovered after day 14. Because the anti-CD8 mAb clone cM-T807 depletes not only CD8+ T cells but also CD3−CD8+ NK cells (31), the frequency and absolute CD3−CD8+ NK cells were also significantly reduced at day 10 compared with day 0 and reached pretreatment levels on day 21 (data not shown). Viral replication was undetectable predepletion in the peripheral blood of these vaccinated animals; however, viral rebound was observed in 6 of 21 animals at day 3 and in 13 of 21 animals on day 7 with the highest frequency of animals with detectable viral replication (71%) on day 14 (15 of 21). As CD8+ T cells reappear, the frequency of animals with viremia decreased to 58% (7 of 12) on day 21 and to only 19% (4 of 21) on day 23 (Fig. 1⇓B). We also examined whether depletion of CD8+ cells altered the absolute CD4+ T cell numbers in these animals. No significant changes were observed for CD4+ T cell numbers before, during, or after CD8+ cell depletion (Fig. 1⇓C). CD4+ T cell numbers are stable during CD8+ cell depletion. A, Absolute CD8+ T cell numbers shown before, during, and after CD8+ cell depletion. Data represents mean ± SE depicted for n = 13–21 animals. B, Viral loads (plasma SHIV RNA copies per milliliter) shown before, during, and after CD8+ cell depletion. Each diamond symbol represents one animal and the horizontal bar is the mean. The dashed horizontal line indicates limit of SHIV RNA detection. Statistically significant changes of CD8+ T cell numbers (A) and viral loads (B) compared with day 0 are depicted by asterisk. C, Absolute number of CD4+ T cell shown before, during, and after CD8+ cell depletion. Data are mean ± SE depicted for n = 13–21 animals. The nonparametric Wilcoxon Signed-Rank test for paired samples was used for statistical analysis. Although CD4+ T cell counts were stable in peripheral blood of CD8+ cell-depleted animals, this does not exclude proliferation and redistribution. We therefore analyzed the expression of Ki-67, a proliferation marker, in CD4+ T cells. Indeed, we found a significant increase in proliferating Ki-67+ CD4+ T cells during CD8+ cell depletion in these animals (Fig. 2⇓, A and B). The frequency of Ki-67+ CD4+ T cells increased by 2.2- ± 0.3-fold from day 0 to 7 and by 2.9- ± 0.3-fold from day 0 to 10 and remained high on days 21 and 31 (Fig. 2⇓, A and B). The frequency of Ki-67+ CD4+ T cells was significantly lower in both PLN and MLN compared with peripheral blood at day 31, the time of necropsy (Fig. 2⇓B). When absolute Ki-67+ CD4+ T cell numbers were calculated in the peripheral blood, significant increases were found when day 0 was compared with day 7 (4.8- ± 1.2-fold increase, p < 0.05), day 10 (2.9- ± 0.4-fold increase, p < 0.001) and day 21 (3.6- ± 0.6-fold increase, p < 0.001) (Fig. 2⇓C). 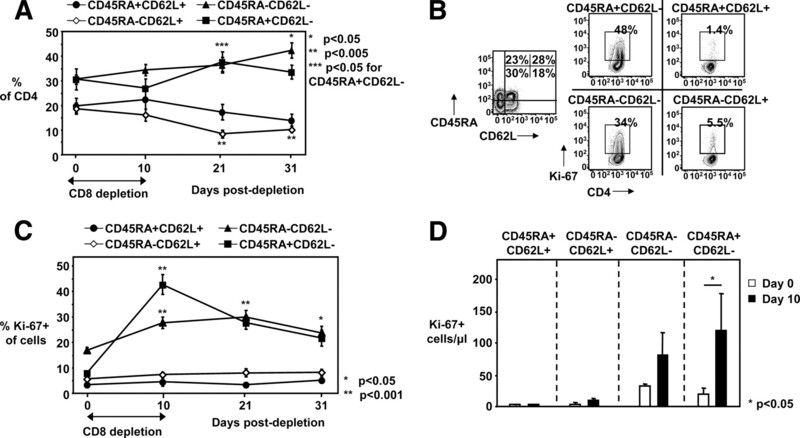 Ki-67+ CD4+ T cells are increased during CD8+ cell depletion. A, Representative FACS plots shown for expression of Ki-67 on peripheral blood CD4+ T cells on day 0 up to day 31 and PLN and MLN CD4+ T cells on day 31 from one animal; Percentage shown indicates Ki-67+ cells of CD4+ T cells. B, Frequency of Ki-67+ cells of CD4+ T cells were measured before (day 0), during (days 7 and 10), and after (days 21 and 31) CD8+ cell depletion in peripheral blood and PLN and MLN (day 31). Bar shows mean ± SE in peripheral blood (n = 9–21 animals), PLN (n = 9), and MLN (n = 8). C, Absolute number of Ki-67+ CD4+ T cells shown for days 0, 7, 10, and 21. Bar shows mean ± SE. Statistical comparison is depicted by lines and asterisks. The nonparametric Wilcoxon Signed-Rank test for paired samples was used for statistical analysis. Next we examined whether proliferation of CD4+ T cells in these animals was dependent on viral rebound. Five of the CD8+ cell-depleted animals did not show rebound of viral replication (Fig. 3⇓A). In these animals, the frequency of Ki-67+ CD4+ T cells nevertheless increased from 9.0 ± 1.1% on day 0 to 24 ± 6.1% on day 10 (Fig. 3⇓A). When the frequency of Ki-67+ CD4+ T cells on day 10 were compared between animals without rebounded viremia (n = 5) and with viremia during CD8+ cell depletion (n = 16), comparable levels were found (Fig. 3⇓B). These findings indicate that CD4+ T cell proliferation in these CD8+ cell-depleted animals is independent of rebound in viral replication. CD4+ T cell homeostatic proliferation is independent of viral replication. A, Frequency of Ki-67+ CD4+ T cells (▴) and viral loads (□) shown for n = 5 animals, which had undetectable viral loads during CD8+ cell depletion. B, Pooled data showing frequency of Ki-67+ CD4+ T cells on days 0 and 10 for animals without viral rebound (n = 5) and animals with viral rebound (n = 16). Bars show mean ± SE. C, SHIV-infected Ki-67+ CD4+ T cells correlate with viral loads. Correlations between SHIV DNA copies/105 Ki-67+ CD4+ T cells and viral loads (plasma SIV RNA copies per milliliter) shown. One animal is represented per data point (▪). D, The frequency of Ki-67+ CD4+ T cells correlates with viral loads (plasma SHIV RNA per milliliter) during CD8+ cell depletion. Viral loads and frequency values of Ki-67+ CD4+ T cells shown for day 0/day 7 (n = 20) and day 0/day 21 (n = 13). C and D, ANOVA regression analysis was used to determine significant correlations. Increased proliferating Ki-67+ CD4+ T cells at effector sites may result in increased plasma viremia because the replication of SIV in Ki-67+ CD4+ T cells is four to seven times higher than in Ki-67− CD4+ T cells (24). This high replication in Ki-67+ CD4+ T cells could contribute to the increase in viral load in CD8-depleted animals we and others have observed (3, 4, 5, 6, 8, 9, 10, 11, 12, 13). To test whether proliferation of CD4+ T cells and viral replication is directly related, we sorted Ki-67+ CD4+ T cells and Ki-67− CD4+ T cells and determined the SHIV DNA copy numbers in these cells on day 7. We found a significant correlation between day 7 plasma viral load and day 7 SHIV DNA copy numbers in Ki-67+ CD4+ T cells (R2 = 0.65, p = 0.016) (Fig. 3⇑C) but not Ki-67− CD4+ T cells (R2 = 0.32, p > 0.05). This finding indicates that although both CD4+ T cell populations can be infected, proliferating CD4+ T cells are the source of rebound viremia, and this underscores the important effect homeostatic proliferation of CD4+ T cells may have on viral replication in these CD8+ cell-depleted animals. We also examined whether frequency of Ki-67+ CD4+ T cells and viral replication correlate during viremia. We analyzed animals with detectable viremia on days 3, 14, and 21. Significant positive correlation was found for all three time points (day 7, R2 = 0.39, p = 0.0035, n = 20 animals; day 21, R2 = 0.52, p = 0.0054, n = 13 (Fig. 3⇑D); day 10 frequency of Ki-67+ CD4+ T cells per day 14 viral loads, R2 = 0.4, p = 0.0005, n = 26). To further evaluate whether homeostatic proliferation of CD4+ T cells can enhance the SIV and SHIV target pool, we examined the effect this proliferation has on memory subpopulation distribution. We have shown that the total CD4+ T cell numbers do not change during CD8+ cell depletion (Fig. 1⇑C); however, the composition of CD4+ T cells still could be altered with an important effect on SIV and SHIV replication as effector memory CD4+ T cells are important targets for SIV (21, 22) and R5X4 SHIV infections. Although the frequency of memory CD4+ T cell subpopulations remained relatively unchanged up to day 10 postdepletion (Fig. 4⇓A), effector memory CD4+ T cells showed significantly increased frequency of Ki-67 expression on day 10 with the CD45RA+CD62L− effector memory CD4+ T cells showing the highest increase (4.5- ± 0.8-fold) (Fig. 4⇓, B and C). When we calculated absolute cell numbers in these subgroups, we found a 2.4- ± 0.9-fold increase between day 0 and 10 for Ki-67+ CD45RA−CD62L− effector memory CD4+ T cells and a 5.8- ± 0.5-fold increase for Ki-67+ CD45RA+CD62L− effector memory CD4+ T cells (Fig. 4⇓D). These data indicate that proliferation of both effector memory CD4+ T cell subpopulations is significantly increased in CD8+ cell-depleted animals, suggesting that CD8+ cell depletion indeed could increased the target pool for SIV and SHIV89.6P infection. Effector memory CD4+ T cells are proliferating during CD8+ cell depletion. A, Frequency of naive (CD45RA+CD62L+), central memory (CD45RA−CD62L+), and effector memory (CD45RA−CD62L−, and CD45RA+CD62L−) CD4+ T cells shown from day 0 to day 31. Data are mean ± SE shown for n = 13–21 animals. B, Representative FACS plots from CD4+ T cells day 10 are shown. Expression of CD45RA and CD62L on CD4+ T cells (left plots) and expression of Ki-67 on CD4+ T cell subpopulations (right plot) are depicted. C, Frequency of Ki-67+ cells of CD4+ T cell subpopulations were measured in peripheral blood before (day 0), during (day 10), and after (days 21 and 31) CD8+ cell depletion in macaques. D, Absolute number of Ki-67+ memory CD4+ T cell subpopulation shown for day 0 and day 10. Data are mean ± SE show for n = 9–21 animals. Statistically significant changes compared with day 0 (A and C) are shown. The nonparametric Wilcoxon Signed-Rank test for paired samples was used for statistical analysis. Numerous studies examining the potential role of CD8+ T cells in controlling HIV and SIV infection have used the depletion of CD8+ T cells from SIV-infected animals to demonstrate a rapid rebound or increase of viral replication (2, 3, 4, 5, 6, 7, 8, 9, 10, 11, 12, 13). This effect of CD8+ cell depletion on viral replication has been interpreted to provide direct evidence that CD8+ T cells play a critical role in controlling SIV replication. This depletion, however, also affects CD3-CD8+ NK cells (31) and this may also contribute to viral control. Although cytotoxic CD8+ T cells undeniably play an important role in suppressing viral replication, the experiments using CD8+ cell depletion suffer from one serious caveat. If depletion of CD8+ cells from the periphery creates homeostatic space that is sensed by CD4+ T cells, these cells may undergo homeostatic proliferation that provides targets for SIV infection and replication, and thus the viral rebound may not be exclusively due to loss of cytotoxic CD8+ T cell control, but also increases in viral targets. Indeed, in this study we show that depletion of CD8+ cells from cynomolgus macaques results in rapid and massive proliferation of CD4+ T cells and this we believe raises the question whether targets are being generated by the ensuing homeostatic proliferation that follows CD8+ cell depletion. The increased proliferation of CD4+ T cells in CD8+ cell depleted animals could be due to homeostatic proliferation or virus-induced activation and/or inflammation of CD4+ T cells. Importantly, we found an increase in Ki-67+ CD4+ T cells in a subgroup of animals without viral rebound. Also, the frequency of Ki-67+ CD4+ T cells was not different between animals with and without viral rebound. These findings suggest that this proliferation is independent of viral replication and virally induced activation or inflammation and that CD8+ cell depletion per se induces CD4+ T cell homeostatic proliferation. Although we have not examined the effect of CD8+ cell depletion on CD4+ T cell homeostatic proliferation in uninfected macaques, it is well established that the depletion of one subset of T cells, i.e., CD4+ or CD8+ T cells, leads to homeostatic proliferation that preserves the total T cell number, which is supported by studies in both mice (16, 17, 18) and humans (19, 20). Recently, such homeostatic proliferation of CD4+ T cells was also confirmed in CD8+ cell-depleted uninfected rhesus macaques (32). The dramatic decrease of HIV-infected Ki-67+ CD4+ T cells after the initiation of highly active antiretroviral therapy has suggested that the bulk of plasma virus comes from such proliferating cells (24, 33). Therefore it is reasonable to assume that providing more proliferating Ki-67+ CD4+ T cells at effector sites may result in increased plasma viremia. It was shown before that replication of SIV in Ki-67+ CD4+ T cells is four to seven times higher than in Ki-67− cells (24). This high replication in Ki-67+ T cells could contribute to the increase in viral load in CD8+ cell-depleted animals we and others have observed (2, 3, 4, 5, 6, 7, 8, 9, 10, 11, 12, 13). A direct correlation between proliferating Ki-67+ CD4+ T cells and viral loads was shown before in CD8+ cell-depleted naturally infected sooty mangabeys, also indicating that the transient increased viral replication was due to the expanded target pool (34). The authors of that study suggested that the increased viral loads in these animals are rather due to an increased target pool for SIV, possible due to CMV reactivation, than the depletion of CD8+ T cells. Our findings in this study with macaques also suggest that increased viral targets for SIV infection may be one mechanism leading to increased viral loads, and that the underlying reason for this increased pool of SIV targets is due to homeostatic proliferation of CD4+ T cells. This is specifically supported by positive correlations we found between the frequency of Ki-67+ CD4+ T cells and viral loads in these animals during the anti-CD8 Ab treatment and also between SHIV plasma viremia and viral DNA in Ki-67+ CD4+ T cells but not viral DNA in Ki-67− CD4+ T cells. A remaining question is whether other factors, specifically neutralizing Abs, could have bias the results of this study. Rasmussen et al. (9) showed that high titer neutralizing Abs in vaccinated macaques could lower the plasma viral loads in CD8+ cell-depleted animals; however, all animals had viral rebound due to CD8+ cell depletion. In our study, only 3 of 21 vaccinated animals showed low titer neutralizing Abs (data not shown) and these animals were comparable in viral rebound with the animals which were negative for neutralizing Abs. This observation suggests that neutralizing Abs did not play a significant role in our study. Our study examining the effect of CD8+ cell depletion on CD4+ T cell homeostasis was part of a vaccine study (26, 35) that used SHIV-89.6P as a challenge virus. The original SHIV89.6 virus is composed of the SIVmac239 with HIV-1-derived auxiliary genes tat, vpu, and rev and the dual-tropic env gene derived from HIV-1 89.6 (29). The pathogenic clone SHIV89.6P was generated by serial in vivo passage (36). The question whether SHIV89.6P is indeed using the coreceptors CCR5 and CXCR4 to infect target cells remains unclear. An early study using in vitro cellular inhibition assays suggested that SHIV89.6P used preferentially CXCR4 in macaque PBMC, although single CCR5-transfected cells could also be infected (37). A more recent study indicated that CXCR4 inhibitors may also inhibit the binding of the virus to CCR5 by a yet unknown mechanism (38). We have observed in our study that during CD8+ cell depletion the frequency of CCR5+ CD4+ T cells increased (data not shown). An increase of CCR5 expression was also observed on proliferating Ki-67+ CD4+ T cells, specifically in the PLN and MLN (data not shown). However, CXCR4 expression was not analyzed on these cells. CXCR4 is preferential expressed by naive and central memory T cells (39), but can be up-regulated through T cell activation (39, 40). Importantly, the majority of CD4+ T cells in the gut-associated lymphoid tissue (GALT), which are effector memory cells, express both CCR5 and CXCR4 and could therefore be preferential target populations for R5, R5X4, and X4 viruses (41, 42, 43). Although the question of coreceptor usage by SHIV89.6P in vivo remains open, the presence of a high number of proliferating CCR5 (and possible CXCR4) expressing effector memory CD4+ T cells would present a major target population for SHIV89.6P, SIV, and HIV. The animals used in our study were cynomolgus macaques, whereas previous CD8+ cell depletion studies used mostly Indian rhesus macaques (2, 4, 5, 6, 8, 9, 10, 11, 12) but also chimpanzees (3) with a variety of viruses used for infection including SHIV89.6P (2, 9). Additional studies are necessary to further elucidate the effect of CD8+ cell depletion on CD4+ T cell homeostatic proliferation and viral rebound and to verify that the macaques and virus used in this study do not pose, although unlikely, a potential bias. Also, although SHIV89.6P was suggested to be a suboptimal challenge virus in CTL-based vaccine studies (commented in Ref. 44), pathogenicity of the virus was not the subject of this study. As discussed earlier, our data suggest that CD4+ T cell homeostatic proliferation induced by CD8+ cell depletion is independent of viral replication and therefore most probably independent of pathogenicity of viral infection. The anti-CD8 mAb clone cM-T807 depletes CD8-expressing cells that include CD8+ T cells and CD3−CD8+ NK cells (31). Therefore, as expected, we saw a reduction not only in CD8+ T cells but also in CD8+ NK cells in the treated animals during CD8+ cell depletion (data not shown). Similar depletion of CD3−CD8+ NK cells were also observed in other studies. However, a role of NK cells in controlling viral replication was deemed rather unlikely as no NK cells were detected in the blood of the animals at time of reappearance of CD8+ T cells and subsequent decline in viremia (2). Our studies are limited to blood and this may not be the best compartment to examine infected cells. Further studies are necessary to analyze the SIV RNA and DNA content of CD4+ T cells in tissues as it was shown recently that in rhesus macaques the highest amount of SIV RNA was found predominately in MLN (45). Such sites may be where proliferating cells get infected. Our results also indicate that although both Ki-67+ and Ki-67− CD4+ T cell populations can be infected, proliferating CD4+ T cells are the source of rebound viremia. Within CD4+ T cell subpopulations, memory CD4+ T cells harbor and produce more viruses compared with naive CD4+ T cells upon activation (46). Furthermore, vaccine-induced proliferation of memory CD4+ T cells was correlated with increased viral replication in rhesus macaques (25). We show in this study that in CD8+ cell-depleted animals, mainly effector memory CD4+ T cells undergo proliferation, and this further supports the notion that proliferating memory CD4+ T cells can indeed increase viral replication in these animals. A previous study that examined peripheral blood Ki-67+ CD4+ T cells during CD8+ cell depletion found a 3-fold increase in absolute peripheral blood Ki-67+ CD4+ T cell numbers, but concluded that these cells cannot account for the viral rebound (4). However, the authors did not examine the phenotype of these cells. In our study, we have shown that these expanded Ki-67+ CD4+ T cells generated during CD8+ cell depletion are predominantly effector memory CD4+ T cells, which support viral replication (46). Also, such changes in peripheral blood absolute numbers may not be representative of changes at effector sites where effector memory CD4+ T cells would migrate. Future studies examining the effect of CD8+ cell depletion on GALT and lymph node lymphocyte populations would address this question. In our study we observed a slow reappearance of CD8+ T cells after day 14, which was followed by regain of viral replication control by the majority of the animals on day 23. Reduced viral replication was already observed on day 21, despite high frequency of proliferating CD4+ T cells. These findings clearly implicate that in the presence of (functional) CD8+ T cells and NK cells, viral replication is controlled, even if the viral target population of proliferating CD4+ T cells are still available. Interestingly, CD4+ T cell proliferation in our study was not accompanied by a substantial increase in absolute numbers of peripheral blood CD4+ T cells. This increase in proliferation without an accompanied increase in absolute numbers can be explained by either an increased turnover of CD4+ T cells due to increased viremia or a rapid redistribution of CD4+ T cells from blood into sites that have “open” space like lymph node and GALT. The most likely reason for the constant CD4+ T cell numbers despite CD4+ T cell proliferation is migration of CD4+ T cells out of peripheral blood and redistribution in other tissue. It is now well established that during acute SIV infection, CD4+ T cells, and in particular effector memory CD4+ T cells, are massively depleted from the GALT (21, 22, 42, 47, 48). In rhesus macaques that progress normally, GALT effector memory CD4+ T cell numbers stabilize after the loss of acute infection, and even partially rebound but never fully recover (49, 50). During the chronic phase, effector memory CD4+ T cells gradually decline and when they fall below a threshold, animals become clinically sick (49). Therefore in acutely or chronically SIV-infected animals, the massive depletion of CD4+ T cells creates space in GALT and probably other tissues, which could be replenished by newly generated CD4+ T cells. We found that CD8+ cell depletion induced a significant increased frequency of CCR5+CD4+ T cells in peripheral blood and this effect would support redistribution of CCR5+ cells out of the peripheral blood into tissues. The importance of CCR5 expression for SIV infection was underlined by data from natural SIV hosts, which have much lower CCR5 expression on CD4+ T cells than non-natural hosts including humans and macaques (51). Besides recruitment of CCR5+CD4+ T cells to nonlymphoid tissue, CCR5+CD4+ T cells that often also express CXCR3 (52, 53) could also be recruited to lymph nodes from HIV-infected individuals by the chemokines CXCL10 and CXCL11 (54). A study published while our manuscript was in review examined the effect CD8+ cell depletion has on CD4+ T cell proliferation and expansion during acute SIVmac239 infection of rhesus macaques (32). In line with our study, the authors also report an increase in percentage of proliferating effector memory and transitional memory CD4+ T cells. The authors also observed an expansion of memory CD4+ T cell numbers in peripheral blood, something we have not seen, indicating a possible difference between acute and chronic SIV infection. Okoye et al. (32) suggested in the study that in acute infection, increased CD4+ T cell proliferation induced by CD8+ cell depletion was not responsible for the increase in viral replication. However, the effect of CD8 depletion could be different in acute infection compared with chronic infection as viral replication is only transiently increased in CD8+ cell depleted chronically SIV infected animals and returns to pretreatment levels after reappearance of CD8+ T cells (our study and Ref. 4). An important difference between the Okoye et al. (32) study and ours is that CD8+ cell depletion during acute infection resulted in a prolonged CD8+ T cell depletion for 84 days, whereas in our study the CD8+ T cell levels were restored by day 23. This may suggest that in addition to CD4+ T cell proliferation, depletion of CD8+ cells during acute infection results in a sustained depletion of SIV-specific CD8+ T cells and this leads to lack of viral control. IL-15 clearly is responsible for CD4+ T cell homeostatic proliferation in CD8+ cell depletion during acute infection (32). Whether it also drives this proliferation during CD8+ cell depletion of chronic infection remains to be established. We have shown that IL-15 is transiently elevated during acute infection but remains undetectable during the chronic phase (55). Therefore, IL-15 may play a more dominant role during CD8+ cell depletion of acute infection. Both the Okoye et al. (32) and our study (data not shown) found that CCR5+CD4+ T cells are increased with CD8+ cell depletion. The results from our study and Okoye et al. (32) show that CD8+ cell depletion induces CD4+ T cell homeostatic proliferation in rhesus macaques and cynomolgus macaques infected with different SIV viruses (SHIV89.6P and SIVmac239), and indicate the general nature of CD8+ cell depletion-induced CD4+ T cell homeostatic proliferation. In conclusion, our findings suggest that CD8+ cell depletion leads to homeostatic proliferation of CD4+ T cells and specifically effector memory CD4+ T cells. The frequency of Ki-67+ CD4+ T cells correlates positively with viral loads during treatment with anti-CD8 Abs. 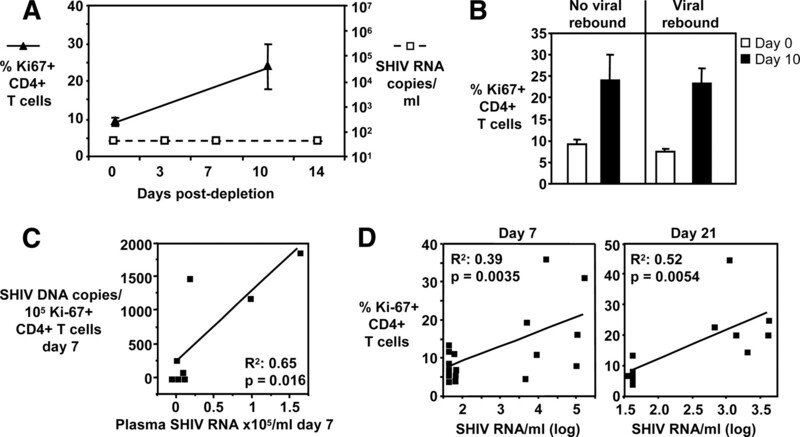 SHIV infection of proliferating Ki-67+ CD4+ T cells also positively correlate with viral loads. This homeostatic proliferation of CD4+ T cells is independent of viral replication as it was also observed in animals without viral rebound and the frequency of Ki-67+ CD4+ T cells in these animals was comparable to animals with viral rebound. Our study does not disprove the role of CD8+ T cells and potential CD8+ NK cells controlling viral replication in SIV and HIV infection. However, our data indicate that the increased viremia found in CD8+ cell-depleted SHIV- and SIV-infected macaques is at least in part due to CD8+ cell depletion-induced homeostatic proliferation of CD4+ T cells. These data also raise the question whether baseline homeostatic proliferation is an important contributor to viremia in HIV-infected patients. ↵1 This study was supported by Grants R01 AI62437 and R01 AI46719 (to P.D.K. ), Grant R01 A1-071886 (to J.D.B. ), and Grants K22 AI07812 and R21 DE018339 (to J.J.M.) all from the National Institutes of Science. D.B.W. was supported in part by grants from the National Institutes of Health. ↵3 Abbreviations used in this paper: SHIV, simian HIV; PLN, peripheral lymph node; MLN, mesenteric lymph node; GALT, gut-associated lymphoid tissue. Petrovas, C., Y. M. Mueller, P. D. Katsikis. 2004. HIV-specific CD8+ T cells: serial killers condemned to die?. Curr. HIV Res. 2: 153-162. Amara, R. R., C. Ibegbu, F. Villinger, D. C. Montefiori, S. Sharma, P. Nigam, Y. Xu, H. M. McClure, H. L. Robinson. 2005. Studies using a viral challenge and CD8 T cell depletions on the roles of cellular and humoral immunity in the control of an SHIV-89.6P challenge in DNA/MVA-vaccinated macaques. Virology 343: 246-255. Castro, B. A., J. Homsy, E. Lennette, K. K. Murthy, J. W. Eichberg, J. A. Levy. 1992. HIV-1 expression in chimpanzees can be activated by CD8+ cell depletion or CMV infection. Clin. Immunol. Immunopathol. 65: 227-233. Jin, X., D. E. Bauer, S. E. Tuttleton, S. Lewin, A. Gettie, J. Blanchard, C. E. Irwin, J. T. Safrit, J. Mittler, L. Weinberger, et al 1999. Dramatic rise in plasma viremia after CD8+ T cell depletion in simian immunodeficiency virus-infected macaques. J. Exp. Med. 189: 991-998. Kawada, M., T. Tsukamoto, H. Yamamoto, A. Takeda, H. Igarashi, D. I. Watkins, T. Matano. 2007. Long-term control of simian immunodeficiency virus replication with central memory CD4+ T-cell preservation after nonsterile protection by a cytotoxic T-lymphocyte-based vaccine. J. Virol. 81: 5202-5211. Lifson, J. D., J. L. Rossio, M. Piatak, Jr, T. Parks, L. Li, R. Kiser, V. Coalter, B. Fisher, B. M. Flynn, S. Czajak, et al 2001. Role of CD8+ lymphocytes in control of simian immunodeficiency virus infection and resistance to rechallenge after transient early antiretroviral treatment. J. Virol. 75: 10187-10199. Madden, L. J., M. A. Zandonatti, C. T. Flynn, M. A. Taffe, M. C. Marcondes, J. E. Schmitz, K. A. Reimann, S. J. Henriksen, H. S. Fox. 2004. CD8+ cell depletion amplifies the acute retroviral syndrome. J. Neurovirol. 10: (Suppl. 1):58-66. Matano, T., R. Shibata, C. Siemon, M. Connors, H. C. Lane, M. A. Martin. 1998. Administration of an anti-CD8 monoclonal antibody interferes with the clearance of chimeric simian/human immunodeficiency virus during primary infections of rhesus macaques. J. Virol. 72: 164-169. Rasmussen, R. A., R. Hofmann-Lehmann, P. L. Li, J. Vlasak, J. E. Schmitz, K. A. Reimann, M. J. Kuroda, N. L. Letvin, D. C. Montefiori, H. M. McClure, R. M. Ruprecht. 2002. Neutralizing antibodies as a potential secondary protective mechanism during chronic SHIV infection in CD8+ T-cell-depleted macaques. AIDS 16: 829-838. Schmitz, J. E., R. P. Johnson, H. M. McClure, K. H. Manson, M. S. Wyand, M. J. Kuroda, M. A. Lifton, R. S. Khunkhun, K. J. McEvers, J. Gillis, et al 2005. Effect of CD8+ lymphocyte depletion on virus containment after simian immunodeficiency virus SIVmac251 challenge of live attenuated SIVmac239δ3-vaccinated rhesus macaques. J. Virol. 79: 8131-8141. Schmitz, J. E., M. J. Kuroda, S. Santra, V. G. Sasseville, M. A. Simon, M. A. Lifton, P. Racz, K. Tenner-Racz, M. Dalesandro, B. J. Scallon, et al 1999. Control of viremia in simian immunodeficiency virus infection by CD8+ lymphocytes. Science 283: 857-860. Veazey, R. S., P. M. Acierno, K. J. McEvers, S. H. Baumeister, G. J. Foster, M. D. Rett, M. H. Newberg, M. J. Kuroda, K. Williams, E. Y. Kim, et al 2008. Increased loss of CCR5+CD45RA−CD4+ T cells in CD8+ lymphocyte-depleted simian immunodeficiency virus-infected rhesus monkeys. J. Virol. 82: 5618-5630. Williams, K., S. Westmoreland, J. Greco, E. Ratai, M. Lentz, W. K. Kim, R. A. Fuller, J. P. Kim, P. Autissier, P. K. Sehgal, et al 2005. Magnetic resonance spectroscopy reveals that activated monocytes contribute to neuronal injury in SIV neuroAIDS. J. Clin. Invest. 115: 2534-2545. Boyman, O., J. F. Purton, C. D. Surh, J. Sprent. 2007. Cytokines and T-cell homeostasis. Curr. Opin. Immunol. 19: 320-326. Surh, C. D., O. Boyman, J. F. Purton, J. Sprent. 2006. Homeostasis of memory T cells. Immunol. Rev. 211: 154-163. Adleman, L. M., D. Wofsy. 1993. T-cell homeostasis: implications in HIV infection. J. Acquir. Immune. Defic. Syndr. 6: 144-152. Adleman, L. M., D. Wofsy. 1996. Blind T-cell homeostasis in CD4-deficient mice. J. Acquir. Immune. Defic. Syndr. Hum. Retrovirol. 11: 334-340. Rocha, B., N. Dautigny, P. Pereira. 1989. Peripheral T lymphocytes: expansion potential and homeostatic regulation of pool sizes and CD4/CD8 ratios in vivo. Eur. J. Immunol. 19: 905-911. Mackall, C. L., T. A. Fleisher, M. R. Brown, M. P. Andrich, C. C. Chen, I. M. Feuerstein, I. T. Magrath, L. H. Wexler, D. S. Dimitrov, R. E. Gress. 1997. Distinctions between CD8+ and CD4+ T-cell regenerative pathways result in prolonged T-cell subset imbalance after intensive chemotherapy. Blood 89: 3700-3707. Margolick, J. B., A. Munoz, A. D. Donnenberg, L. P. Park, N. Galai, J. V. Giorgi, M. R. O'Gorman, J. Ferbas. 1995. Failure of T-cell homeostasis preceding AIDS in HIV-1 infection: the Multicenter AIDS Cohort Study. Nat. Med. 1: 674-680. Mattapallil, J. J., D. C. Douek, B. Hill, Y. Nishimura, M. Martin, M. Roederer. 2005. Massive infection and loss of memory CD4+ T cells in multiple tissues during acute SIV infection. Nature 434: 1093-1097. Veazey, R. S., M. DeMaria, L. V. Chalifoux, D. E. Shvetz, D. R. Pauley, H. L. Knight, M. Rosenzweig, R. P. Johnson, R. C. Desrosiers, A. A. Lackner. 1998. Gastrointestinal tract as a major site of CD4+ T cell depletion and viral replication in SIV infection. Science 280: 427-431. Zhang, Z. Q., S. W. Wietgrefe, Q. Li, M. D. Shore, L. Duan, C. Reilly, J. D. Lifson, A. T. Haase. 2004. Roles of substrate availability and infection of resting and activated CD4+ T cells in transmission and acute simian immunodeficiency virus infection. Proc. Natl. Acad. Sci. USA 101: 5640-5645. Zhang, Z., T. Schuler, M. Zupancic, S. Wietgrefe, K. A. Staskus, K. A. Reimann, T. A. Reinhart, M. Rogan, W. Cavert, C. J. Miller, et al 1999. Sexual transmission and propagation of SIV and HIV in resting and activated CD4+ T cells. Science 286: 1353-1357. Staprans, S. I., A. P. Barry, G. Silvestri, J. T. Safrit, N. Kozyr, B. Sumpter, H. Nguyen, H. McClure, D. Montefiori, J. I. Cohen, M. B. Feinberg. 2004. Enhanced SIV replication and accelerated progression to AIDS in macaques primed to mount a CD4 T cell response to the SIV envelope protein. Proc. Natl. Acad. Sci. USA 101: 13026-13031. Boyer, J. D., T. M. Robinson, M. A. Kutzler, G. Vansant, D. A. Hokey, S. Kumar, R. Parkinson, L. Wu, M. K. Sidhu, G. N. Pavlakis, et al 2007. Protection against simian/human immunodeficiency virus (SHIV) 89.6P in macaques after coimmunization with SHIV antigen and IL-15 plasmid. Proc. Natl. Acad. Sci. USA 104: 18648-18653. Mueller, Y. M., D. H. Do, S. R. Altork, C. M. Artlett, E. J. Gracely, C. D. Katsetos, A. Legido, F. Villinger, J. D. Altman, C. R. Brown, et al 2008. IL-15 treatment during acute simian immunodeficiency virus (SIV) infection increases viral set point and accelerates disease progression despite the induction of stronger SIV-specific CD8+ T cell responses. J. Immunol. 180: 350-360. Mueller, Y. M., C. Petrovas, P. M. Bojczuk, I. D. Dimitriou, B. Beer, P. Silvera, F. Villinger, J. S. Cairns, E. J. Gracely, M. G. Lewis, P. D. Katsikis. 2005. Interleukin-15 increases effector memory CD8+ T cells and NK cells in simian immunodeficiency virus-infected macaques. J. Virol. 79: 4877-4885. Reimann, K. A., J. T. Li, G. Voss, C. Lekutis, K. Tenner-Racz, P. Racz, W. Lin, D. C. Montefiori, D. E. Lee-Parritz, Y. Lu, et al 1996. An env gene derived from a primary human immunodeficiency virus type 1 isolate confers high in vivo replicative capacity to a chimeric simian/human immunodeficiency virus in rhesus monkeys. J. Virol. 70: 3198-3206. Douek, D. C., J. M. Brenchley, M. R. Betts, D. R. Ambrozak, B. J. Hill, Y. Okamoto, J. P. Casazza, J. Kuruppu, K. Kunstman, S. Wolinsky, et al 2002. HIV preferentially infects HIV-specific CD4+ T cells. Nature 417: 95-98. Schmitz, J. E., M. A. Simon, M. J. Kuroda, M. A. Lifton, M. W. Ollert, C. W. Vogel, P. Racz, K. Tenner-Racz, B. J. Scallon, M. Dalesandro, et al 1999. A nonhuman primate model for the selective elimination of CD8+ lymphocytes using a mouse-human chimeric monoclonal antibody. Am. J. Pathol. 154: 1923-1932. Okoye, A., H. Park, M. Rohankhedkar, L. Coyne-Johnson, R. Lum, J. M. Walker, S. L. Planer, A. W. Legasse, A. W. Sylwester, M. Piatak, et al 2009. Profound CD4+/CCR5+ T cell expansion is induced by CD8+ lymphocyte depletion but does not account for accelerated SIV pathogenesis. J. Exp. Med. 206: 1575-1588. Tenner-Racz, K., H. J. Stellbrink, J. van Lunzen, C. Schneider, J. P. Jacobs, B. Raschdorff, G. Grosschupff, R. M. Steinman, P. Racz. 1998. The unenlarged lymph nodes of HIV-1-infected, asymptomatic patients with high CD4 T cell counts are sites for virus replication and CD4 T cell proliferation: the impact of highly active antiretroviral therapy. J. Exp. Med. 187: 949-959. Barry, A. P., G. Silvestri, J. T. Safrit, B. Sumpter, N. Kozyr, H. M. McClure, S. I. Staprans, M. B. Feinberg. 2007. Depletion of CD8+ cells in sooty mangabey monkeys naturally infected with simian immunodeficiency virus reveals limited role for immune control of virus replication in a natural host species. J. Immunol. 178: 8002-8012. Yin, J., A. Dai, M. A. Kutzler, A. Shen, J. Lecureux, M. G. Lewis, T. Waldmann, D. B. Weiner, J. D. Boyer. 2008. Sustained suppression of SHIV89.6P replication in macaques by vaccine-induced CD8+ memory T cells. AIDS 22: 1739-1748. Karlsson, G. B., M. Halloran, J. Li, I. W. Park, R. Gomila, K. A. Reimann, M. K. Axthelm, S. A. Iliff, N. L. Letvin, J. Sodroski. 1997. Characterization of molecularly cloned simian-human immunodeficiency viruses causing rapid CD4+ lymphocyte depletion in rhesus monkeys. J. Virol. 71: 4218-4225. Zhang, Y., B. Lou, R. B. Lal, A. Gettie, P. A. Marx, J. P. Moore. 2000. Use of inhibitors to evaluate coreceptor usage by simian and simian/human immunodeficiency viruses and human immunodeficiency virus type 2 in primary cells. J. Virol. 74: 6893-6910. Maeda, Y., K. Yusa, S. Harada. 2008. Altered sensitivity of an R5X4 HIV-1 strain 89.6 to coreceptor inhibitors by a single amino acid substitution in the V3 region of gp120. Antiviral Res. 77: 128-135. Bleul, C. C., L. Wu, J. A. Hoxie, T. A. Springer, C. R. Mackay. 1997. The HIV coreceptors CXCR4 and CCR5 are differentially expressed and regulated on human T lymphocytes. Proc. Natl. Acad. Sci. USA 94: 1925-1930. Patterson, B. K., M. Czerniewski, J. Andersson, Y. Sullivan, F. Su, D. Jiyamapa, Z. Burki, A. Landay. 1999. Regulation of CCR5 and CXCR4 expression by type 1 and type 2 cytokines: CCR5 expression is downregulated by IL-10 in CD4-positive lymphocytes. Clin. Immunol. 91: 254-262. Lapenta, C., M. Boirivant, M. Marini, S. M. Santini, M. Logozzi, M. Viora, F. Belardelli, S. Fais. 1999. Human intestinal lamina propria lymphocytes are naturally permissive to HIV-1 infection. Eur. J. Immunol. 29: 1202-1208. Mehandru, S., M. A. Poles, K. Tenner-Racz, A. Horowitz, A. Hurley, C. Hogan, D. Boden, P. Racz, M. Markowitz. 2004. Primary HIV-1 infection is associated with preferential depletion of CD4+ T lymphocytes from effector sites in the gastrointestinal tract. J. Exp. Med. 200: 761-770. Meng, G., M. T. Sellers, M. Mosteller-Barnum, T. S. Rogers, G. M. Shaw, P. D. Smith. 2000. Lamina propria lymphocytes, not macrophages, express CCR5 and CXCR4 and are the likely target cell for human immunodeficiency virus type 1 in the intestinal mucosa. J. Infect. Dis. 182: 785-791. Feinberg, M. B., J. P. Moore. 2002. AIDS vaccine models: challenging challenge viruses. Nat. Med. 8: 207-210. Cumont, M. C., V. Monceaux, L. Viollet, S. Lay, R. Parker, B. Hurtrel, J. Estaquier. 2007. TGF-beta in intestinal lymphoid organs contributes to the death of armed effector CD8 T cells and is associated with the absence of virus containment in rhesus macaques infected with the simian immunodeficiency virus. Cell Death Differ. 14: 1747-1758. Ostrowski, M. A., T. W. Chun, S. J. Justement, I. Motola, M. A. Spinelli, J. Adelsberger, L. A. Ehler, S. B. Mizell, C. W. Hallahan, A. S. Fauci. 1999. Both memory and CD45RA+/CD62L+ naive CD4+ T cells are infected in human immunodeficiency virus type 1-infected individuals. J. Virol. 73: 6430-6435. Li, Q., L. Duan, J. D. Estes, Z. M. Ma, T. Rourke, Y. Wang, C. Reilly, J. Carlis, C. J. Miller, A. T. Haase. 2005. Peak SIV replication in resting memory CD4+ T cells depletes gut lamina propria CD4+ T cells. Nature 434: 1148-1152. Brenchley, J. M., T. W. Schacker, L. E. Ruff, D. A. Price, J. H. Taylor, G. J. Beilman, P. L. Nguyen, A. Khoruts, M. Larson, A. T. Haase, D. C. Douek. 2004. CD4+ T cell depletion during all stages of HIV disease occurs predominantly in the gastrointestinal tract. J. Exp. Med. 200: 749-759. Okoye, A., M. Meier-Schellersheim, J. M. Brenchley, S. I. Hagen, J. M. Walker, M. Rohankhedkar, R. Lum, J. B. Edgar, S. L. Planer, A. Legasse, et al 2007. Progressive CD4+ central memory T cell decline results in CD4+ effector memory insufficiency and overt disease in chronic SIV infection. J. Exp. Med. 204: 2171-2185. Picker, L. J., S. I. Hagen, R. Lum, E. F. Reed-Inderbitzin, L. M. Daly, A. W. Sylwester, J. M. Walker, D. C. Siess, M. Piatak, Jr, C. Wang, et al 2004. Insufficient production and tissue delivery of CD4+ memory T cells in rapidly progressive simian immunodeficiency virus infection. J. Exp. Med. 200: 1299-1314. Pandrea, I., C. Apetrei, S. Gordon, J. Barbercheck, J. Dufour, R. Bohm, B. Sumpter, P. Roques, P. A. Marx, V. M. Hirsch, et al 2007. Paucity of CD4+CCR5+ T cells is a typical feature of natural SIV hosts. Blood 109: 1069-1076. Qin, S., J. B. Rottman, P. Myers, N. Kassam, M. Weinblatt, M. Loetscher, A. E. Koch, B. Moser, C. R. Mackay. 1998. The chemokine receptors CXCR3 and CCR5 mark subsets of T cells associated with certain inflammatory reactions. J. Clin. Invest. 101: 746-754. Rabin, R. L., M. A. Alston, J. C. Sircus, B. Knollmann-Ritschel, C. Moratz, D. Ngo, J. M. Farber. 2003. CXCR3 is induced early on the pathway of CD4+ T cell differentiation and bridges central and peripheral functions. J. Immunol. 171: 2812-2824. Foley, J. F., C. R. Yu, R. Solow, M. Yacobucci, K. W. Peden, J. M. Farber. 2005. Roles for CXC chemokine ligands 10 and 11 in recruiting CD4+ T cells to HIV-1-infected monocyte-derived macrophages, dendritic cells, and lymph nodes. J. Immunol. 174: 4892-4900. Eberly, M. D., M. Kader, W. Hassan, K. A. Rogers, J. Zhou, Y. M. Mueller, M. J. Mattapallil, M. Piatak, Jr, J. D. Lifson, P. D. Katsikis, et al 2009. Increased IL-15 production is associated with higher susceptibility of memory CD4 T cells to simian immunodeficiency virus during acute infection. J. Immunol. 182: 1439-1448.